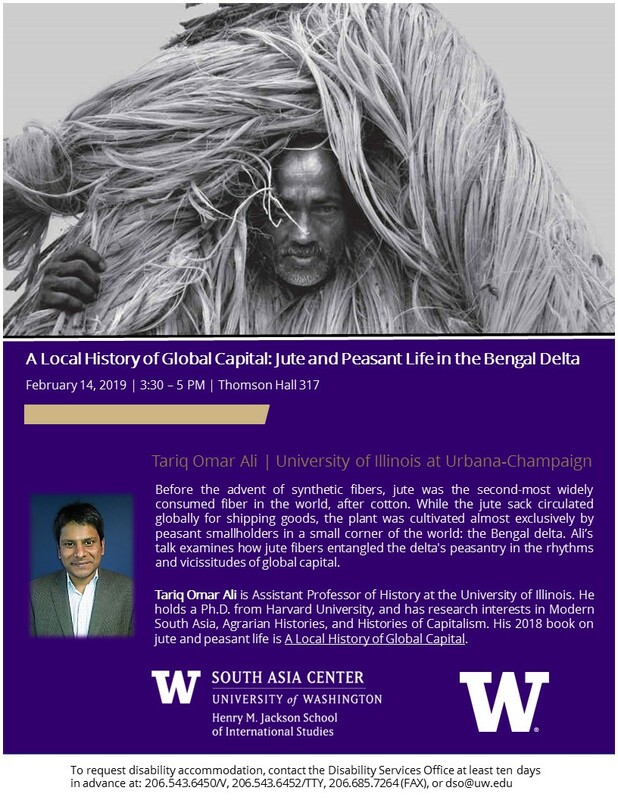 Thursday, Feb 14, 2019, 3:30 – 5 p.m.
South Asia Studies Colloquium: "A Local History of Global Capital: Jute and Peasant Life in the Bengal Delta"
Before the advent of synthetic fibers, jute was the second-most widely consumed fiber in the world, after cotton. While the jute sack circulated globally for shipping goods, the plant was cultivated almost exclusively by peasant smallholders in a small corner of the world: the Bengal delta. Ali’s talk examines how jute fibers entangled the delta's peasantry in the rhythms and vicissitudes of global capital. Tariq Omar Ali is Assistant Professor of History at the University of Illinois. He holds a Ph.D. from Harvard University, and has research interests in Modern South Asia, Agrarian Histories, and Histories of Capitalism. His 2018 book on jute and peasant life is A Local History of Global Capital. Professor Ali will also speak at the Saturday University lecture series hosted by Gardner Center for Asian Art and Ideas. Get tickets to his talk here.